After Paul Stalteri scored his injury-time winner against West Ham in March, there was a certain air of satisfaction about Les Ferdinand’s summary of the performance on ‘Match Of The Day’ that evening. Throughout the match he had been on the sharp end of a ragging from former Arsenal star and fellow football pundit Lee Dixon, but Ferdinand was adamant that Tottenham would pull themselves back into the game. He’s a Spurs fan, after all, and he makes no bones about it. It’s rare for a professional footballer to keep such passion for his childhood club after making a career in the game, but for Ferdinand it has always been Spurs. Where ever he was playing, it was the Tottenham result he looked for first after coming off the pitch and his dream of pulling on a Spurs shirt was the most important deciding factor when he chose to come to White Hart Lane from Newcastle in July 1997. 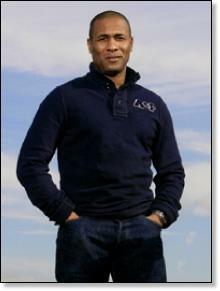 These days Les Ferdinand is a season ticket holder and gets to White Hart Lane when work commitments allow. Like any other fan he is entitled to his views on the Martin Jol era, but on the whole he seems rather satisfied with Tottenham in 2007. “I’ve been very impressed with the current team,” he says. “I expected them to push on a little bit better than they have done since last season, but obviously Michael Carrick leaving was a big miss for them – you don’t lose a player like that without it having an effect on the team. But I still feel we are in good shape and I’ve been so impressed with Berbatov. When Jermain Defoe came in after Robbie Keane was unfortunately injured he created a great partnership up front with Berbatov. Being a centre-forward it’s always the first thing I look at. I think they’ve got a good understanding going. I’ve been very impressed. In six seasons at the club, Les Ferdinand played under four managers and two caretaker managers. “Gerry Francis was only there for a short space of time after I got there and a little while after that he decided to quit as he’d had enough of football.